Existing-home sales, which are completed transactions that include single-family, townhomes, condominiums and co-ops, fell 3.8 percent to a seasonally adjusted annual rate of 4.81 million in May from a downwardly revised 5.00 million in April, and are 15.3 percent below a 5.68 million pace in May 2010 when sales were surging to beat the deadline for the home buyer tax credit. 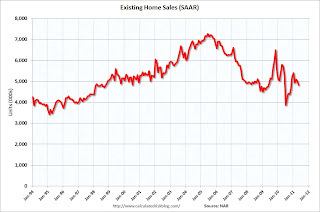 Sales in May 2011 (4.81 million SAAR) were 3.8% lower than last month, and were 15.3% lower than in May 2010. According to the NAR, inventory decreased to 3.72 million in May from 3.76 million in April. 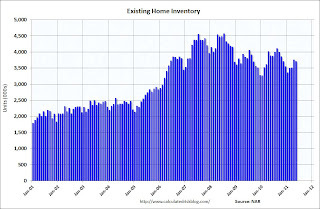 Inventory decreased 4.4% year-over-year in May from May 2010. 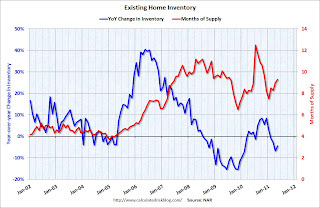 This is the fourth consecutive month with a YoY decrease in inventory. Inventory should increase over the next couple of months months (the normal seasonal pattern), and the YoY change is something to watch closely this year. Months of supply increased to 9.3 months in May, up from 9.0 months in April. This is much higher than normal. These sales numbers were slightly above the consensus of 4.75 million SAAR (Lawler's forecast was 4.8 million using the NAR method). There was no mention of the coming revisions. I'll have more later.